Please contact me regarding the 2019 Trail King TK80MG - Stock# TK80MG HG MO3 for sale at TruckerToTrucker.com. Take a look at this 2019 Trail King TK80MG. It is Stock# TK80MG HG MO3 at TruckerToTrucker.com. New Trail King model TK80MG detachable goose-neck 70,000#'s in 16'. 29' clear in the well, mini boom trough, 18 lower deck height, triple doughnut neck height adjustment, tapered approach (4 at begging of loading ramp), flag holders, wide load brackets, (7) pair of marker lights per side, amber strobes in rear, 4-way plug in rear, Hendrickson air ride suspension with adjustable ride height positions, raise and lower valve, liquid filled air gauge, 25,000# axles on 54.5 spacing, 9' 10 upper deck with 14 king pin (82 swing clearance), tool box in neck with locking lid, tool box in floor with cover up Apitong planks, cow boy hat shaped key hole chain drop slots on 24 centers, full width crossmembers in main frame on 12 centers, swing out outriggers, LP 22.5 General tires on all steel wheels (aluminum wheels available at additional cost), set up for a 3rd axle flip (3rd axle flip in stock and sold as a separate component at additional cost). TNT Sales is your one stop shop for all open deck needs. We are a full service dealership including parts, accessories, rentals, repairs and reconditioning. We offer a used trailer warranty on our reconditioned used trailers. 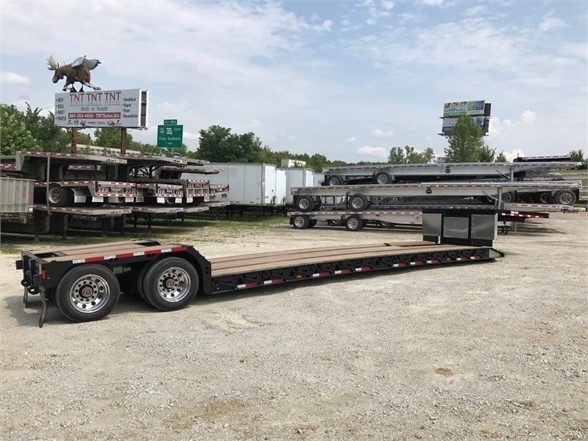 We stock and install the following: Tool boxes, ramp kits, chains, binders, straps, bungees and bulkheads, headache racks, tarps, side kits, sliding tarp systems, aluminum wheels, new and used tires and everything you need for your flatbed, drop deck or lowboy. We are well staffed, focusing on good customer service as well as service after the sale. Our excellent selection of premium products, combined with our simple purchasing process, gets you back on the road, generating revenue. Disclaimer: Photos and videos on the web are units of our stock trailers. Specifications are subject to change in photographs and videos. Please adhere to specifications per listing in order to avoid misunderstandings.